Clover Imaging Group provides unparalleled support, collection opportunities, and solutions to independent dealers, OEMs, and retailers throughout the imaging channel and includes the most respected and well-known brands in the industry including: MSE, Dataproducts, freecolor, Re-Post, Clover Environmental Solutions, collecture, Axess Managed Print Services. 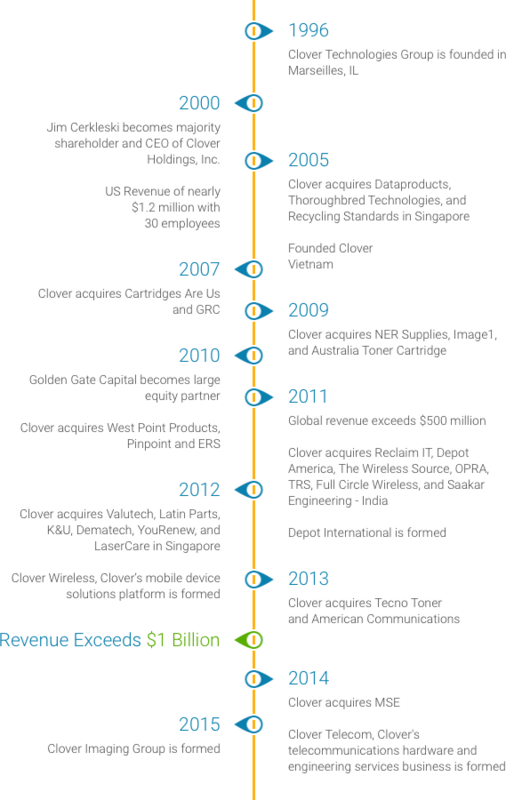 The Clover Imaging Group provides unparalleled support, collection opportunities, and solutions to independent dealers, OEMs, and retailers throughout the imaging channel. Our diverse array of products ranges from remanufactured toner, ink, and postage cartridges. We support these products with a continued investment into engineering and innovation. CIG’s number one priority is serving our customers. Every person within the CIG organisation is focused on understanding our customers’ needs and ensuring an outstanding customer experience.